I’m on a roll and enjoying the fact that momentum from my recent decluttering success has me suddenly expanding the effort to reach items that have sat untouched for almost six years. With my closet in the bedroom clean, and the drawers in my dresser unstuffed, I went on to tackle the pile of papers and odd collection of pocket leftovers that get dumped on the inviting flat expanse of the dresser top. Included in the stack was the form for renewing my passport that I had filled out four months ago. That form was awaiting a headshot photo that met the specific requirements for dimensions and quality. It took a little while for Cyndie and me to find the right background to take the photo ourselves. Once that was done, I needed to print it on photo paper. That provided another easy opportunity for delay. Friday, that renewal form finally made it to the post office and all that dresser top debris has now been dispatched to logical organized locations. That accomplishment helped to fuel continued momentum that took me back out into the shop where there is now a glorious new open space where the foosball table top once stood. On the right side of the image above, there is a box against the wall that has been sitting there since we settled in here back in 2012. 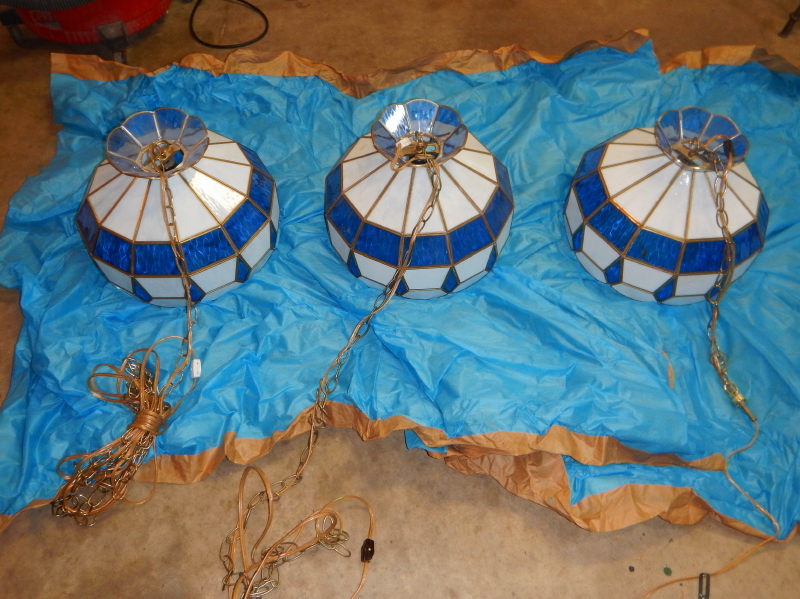 We had removed three hanging light fixtures from the basement and I packaged them up to sell or give away. It’s just one of those things I didn’t get around to finishing that the box sat there untouched all this time. Yesterday, I opened up the box, removed all the mouse-chewed bits of cardboard and packing paper, threw away the stash of acorns the rodents stowed, and laid out the light fixtures to take pictures for an ad. They’re out there in the Craigslist universe now, hoping to find a new home. And I am going to keep going. I think I will finally throw out that old tattered seat I replaced on the lawn tractor that sold last month. I had placed the ripped vinyl seat back into the same box the new had come in. The tractor is gone, but I still have the throw-away seat left over from it. Really? Boy, I gotta say, this decluttering progress is a real feel-good endeavor. No wonder I’ve become so inspired to keep going. 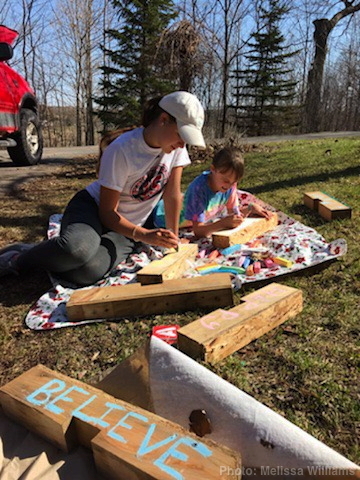 After a second visit on Saturday for pure maple syrup and pancakes, Cyndie enlisted the artistic energies of visiting Williams girls, Ella and Sarah, to decorate some of the new blocks before we placed them on the trail. It’s a bit of a shame that their designs will all too quickly be subject to the abuses of plodding muddy boots and paws, but that won’t stop the creative exclamations from still offering glimpses of inspiration to passersby. The 60 new blocks paved another 8.5 feet of sloppy trail, but we’re still going to need a lot more pallets if we want to cover the length of perpetually wet ground down there. 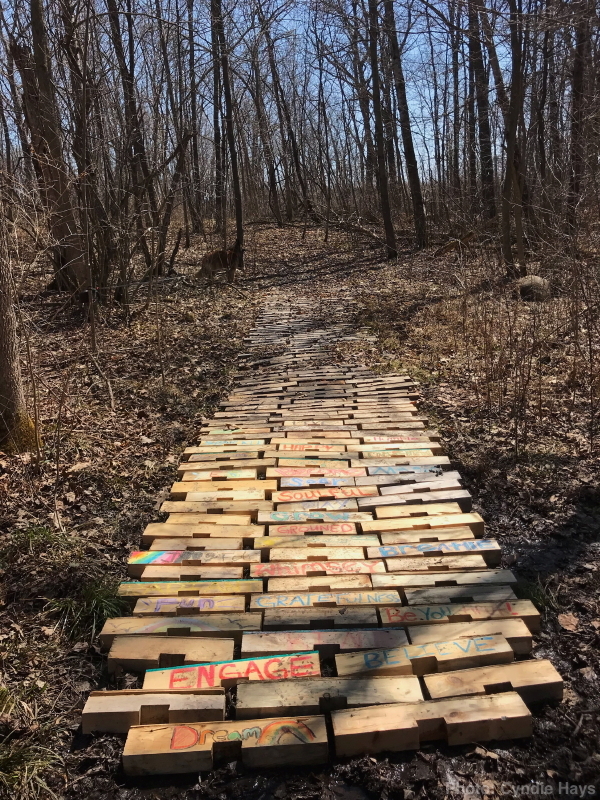 The picture I used yesterday to show the blocks on the trail was from October of 2016. Yesterday, Cyndie took a picture with the newest blocks in the foreground, which is actually viewing in the opposite direction from the first image. It’s not an exact comparison, but I like seeing one next to the other. Can you see how far in the distance the old blocks run in the picture on the right? Reminds me a little of the yellow brick road. Oh my! 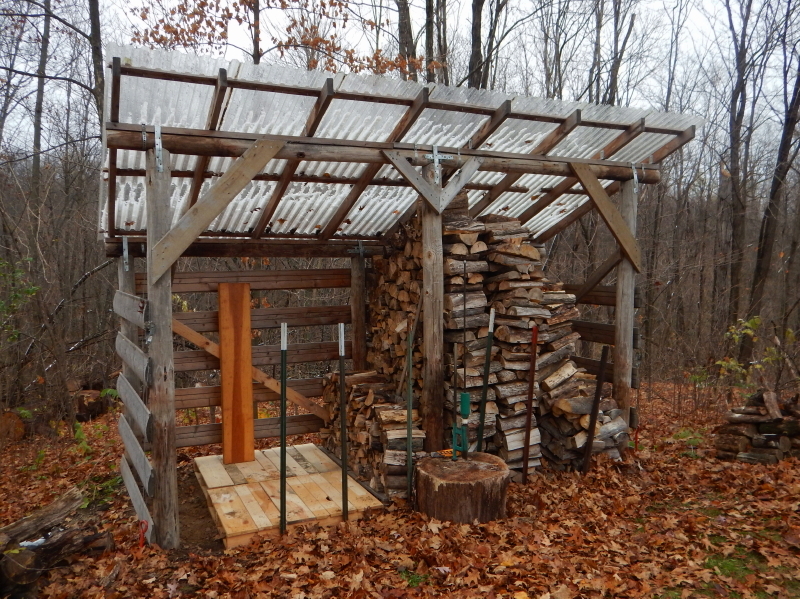 You may recall that I built our chicken coop using wood predominantly gathered from pallets I salvaged at my workplace. Even though our coop is complete, the pallets keep coming. At the day-job, equipment arrives mounted to brand new pallets that the manufacturer doesn’t want returned. 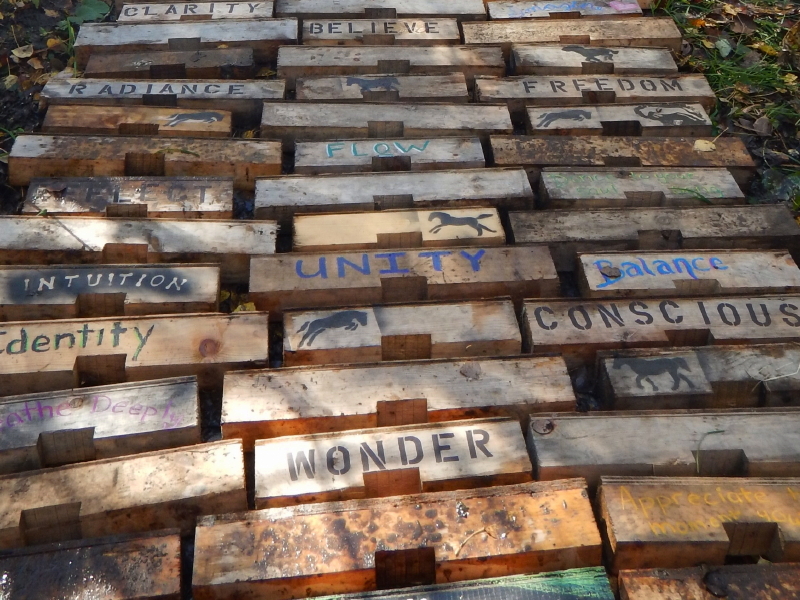 I hate to imagine the wood pallets getting discarded after just one short shipping journey, so I continue to look for ways we can use them on the ranch. One immediate need is in improving the footing on our trails where the surface is frequently such a muddy mess that you could lose a shoe if not careful. The pallets I bring home from work have four blocks nailed on top which make it difficult to stack things on them, like bales of hay. 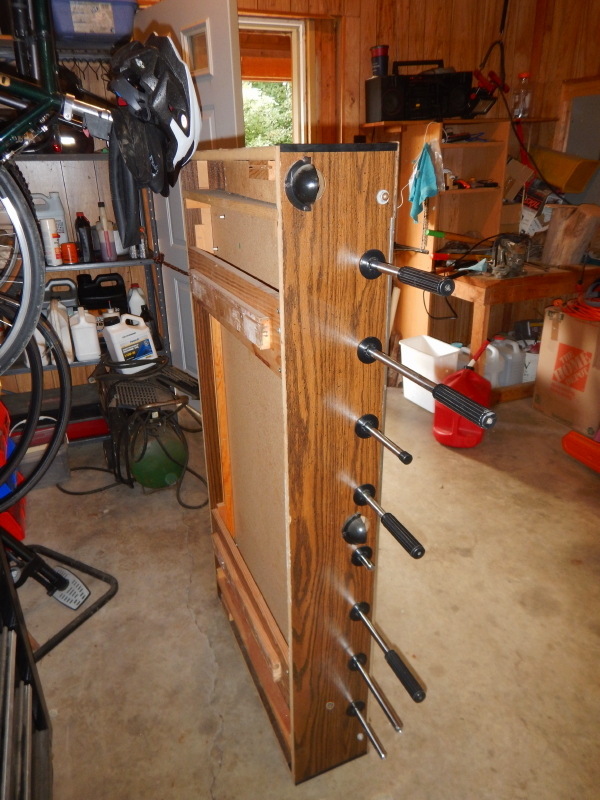 Since that is a primary use for the pallets, my first project in reuse involves removing the blocks. 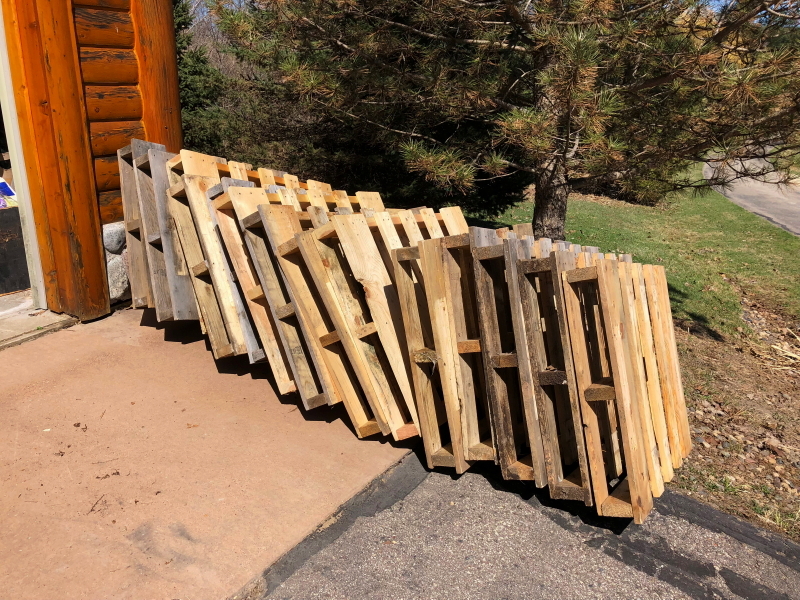 The pallets almost always arrive in sets of three, and my knack for procrastination plays out in a tendency to wait to remove the top blocks until some later time. Yesterday, being warm and sunny, turned out to be one of those later times. Turns out our collection of pallets had grown to 15. That just so happens to mean 60 blocks, all power-nailed to the planks on the pallets. My right arm got a decent workout swinging the 3-pound hammer against the pry bar. 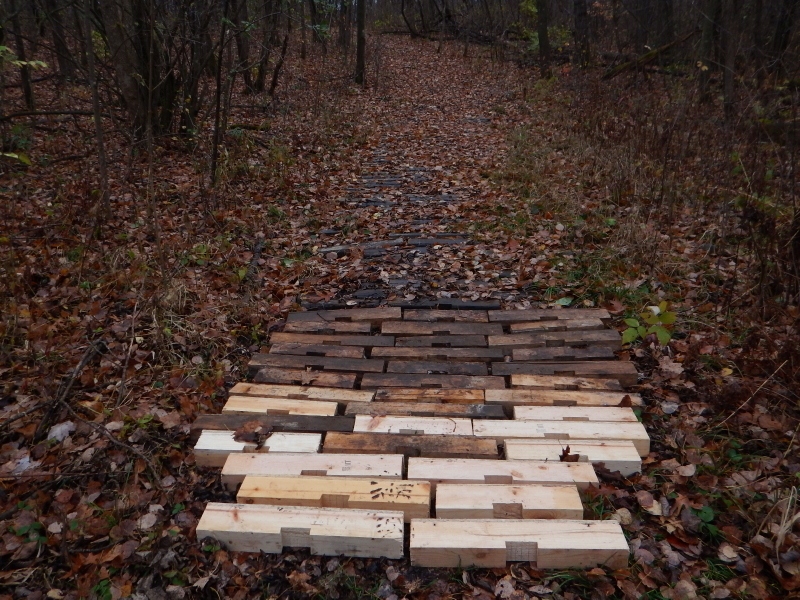 Today we hope to extend the “paved” portion of muddy trail with the newly harvested blocks. After that, the plan is to put up the temporary protective fenced courtyard around the chicken coop in preparation for the chicks first ventures out on real earth. For me, building our chicken coop was a stretch. I’d never tried any construction project of that magnitude before, and I was choosing to work from found materials and without a blueprint. It was a small miracle it turned out as well as it did. Now, Cyndie is telling me we need to modify it to have a divider that will allow us to introduce unfamiliar birds to the existing flock of three. Today, a functional version of her vision is completely beyond me. I have no idea how I will secure all the nooks and crannies with chicken wire to a point where two unfamiliar flocks of birds will co-exist for a while in that one coop. On to something I can do. Yesterday, I put the old F150 to work doing double duty. 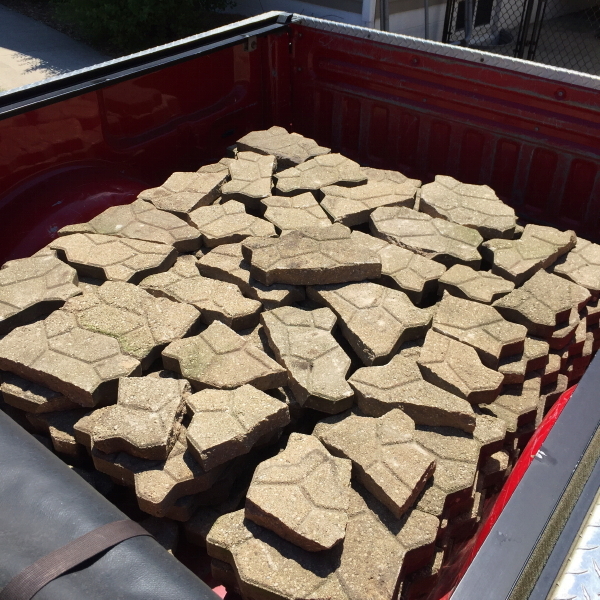 First, it was a road trip to the cities to pick up a load of unwanted used pavers from a staff member at the day-job. Drew was nice enough to offer them up for free if I would go to his place and make them disappear. 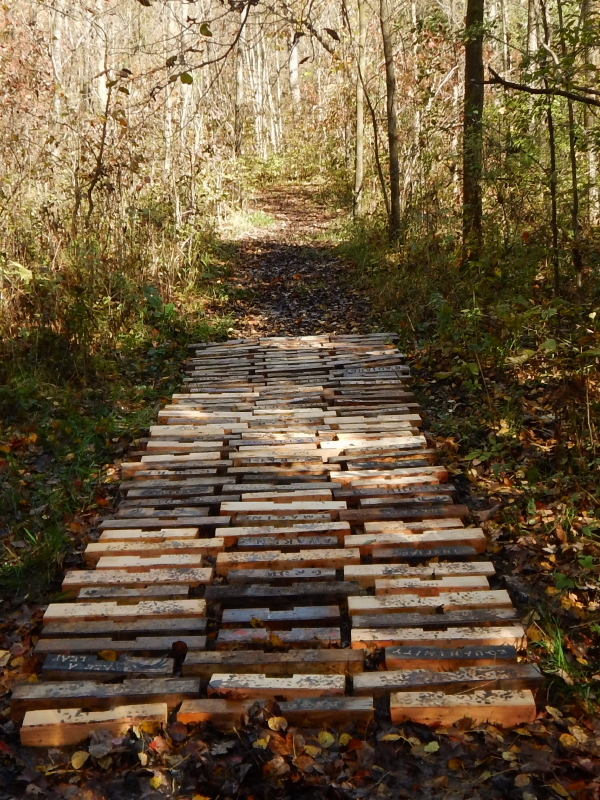 I had a plan to use them on one of the muddy spots on our trail through the woods. Before I could get to that step, I needed to reclaim a pile of rock that I had stumbled upon when creating a path to the new chicken coop last year. There was an old rusty box stove in the woods that I believe was used to boil syrup. It looked to be generations old, and the area around it had some old busted cinder blocks and a pile of landscape rocks. 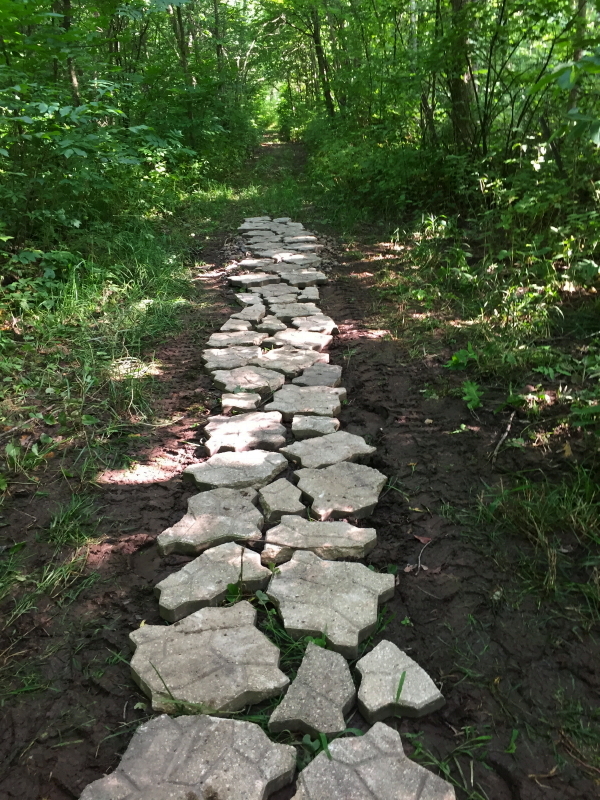 Those rocks would serve nicely to fill a spot in the trail that tends to puddle, so before setting the new paver pieces in place, I wanted to transfer the rocks. 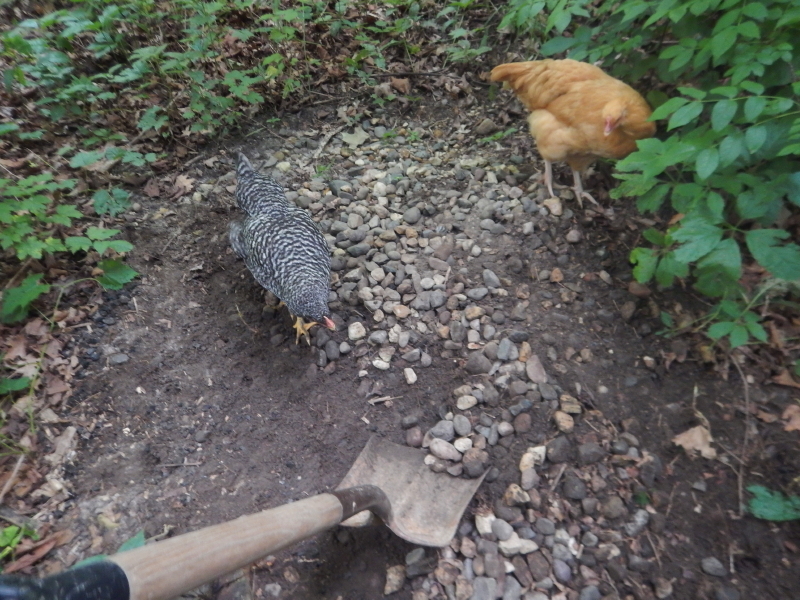 The chickens showed up to help, but were almost too eager to get after the creepy crawling creatures revealed when I scooped a shovel-full. They were more interference than they were helpers, but they sure are cute to have as company. While the hours of the day vanished, one after the other, I hustled to get the pavers moved out of the truck. We had an appointment to pick up a load of hay around dinner time. 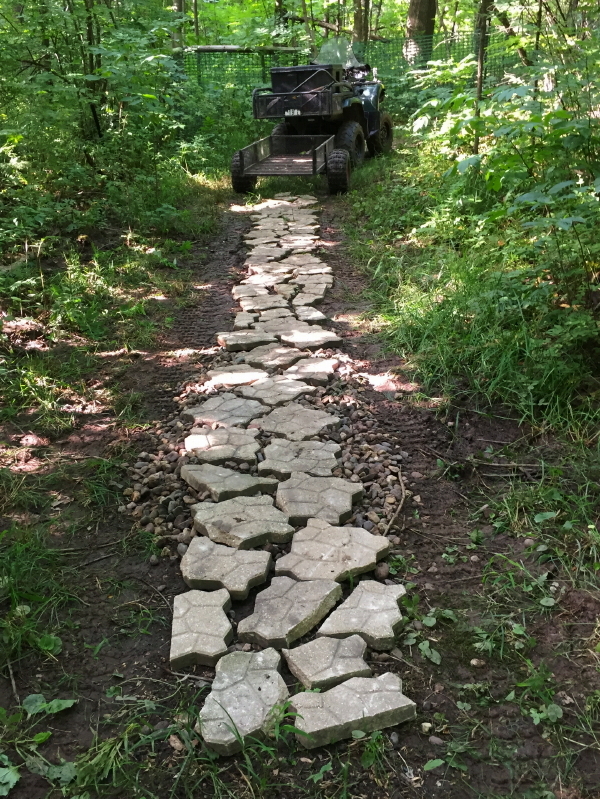 Hoping to minimize the handling, I wanted to transfer from the truck to the ATV trailer so I could deliver pavers directly to the path in the woods. After a cursory two trips of distributing pavers, I had a good start on the trail, but needed to stack the rest up by the shop for use at a later time. The appointed hay hour was fast approaching. 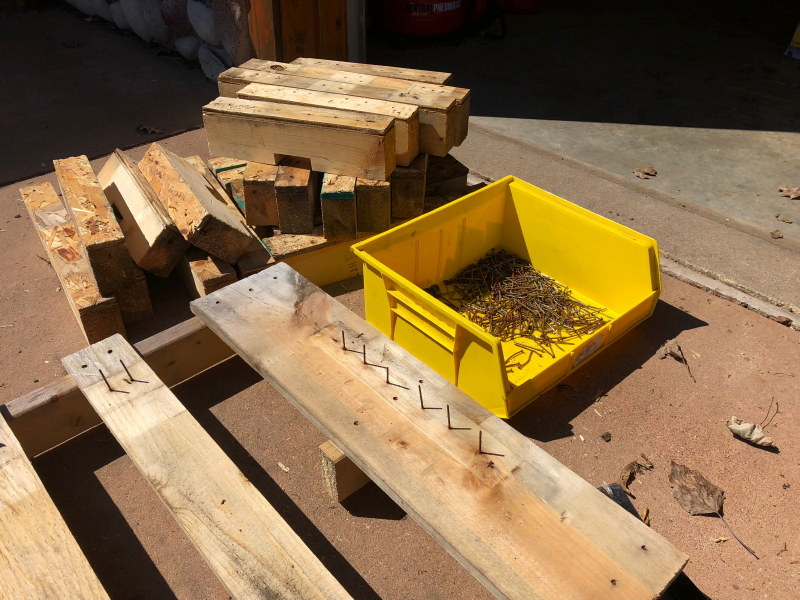 Given this morning’s new assignment with the chicken coop, I am thoroughly enjoying the mental ease and physical feasibility of yesterday’s projects. New hay is stacked in the shed and pavers cover the muddy trail. Next time it rains I’ll be excited to walk the enhanced surface of the trail at the bottom of the hill. The frozen season has finally arrived. It’s got me wanting to have a fire, and since we still aren’t able to have one indoors due to the cracks in the flue, I started one in our outdoor pit. 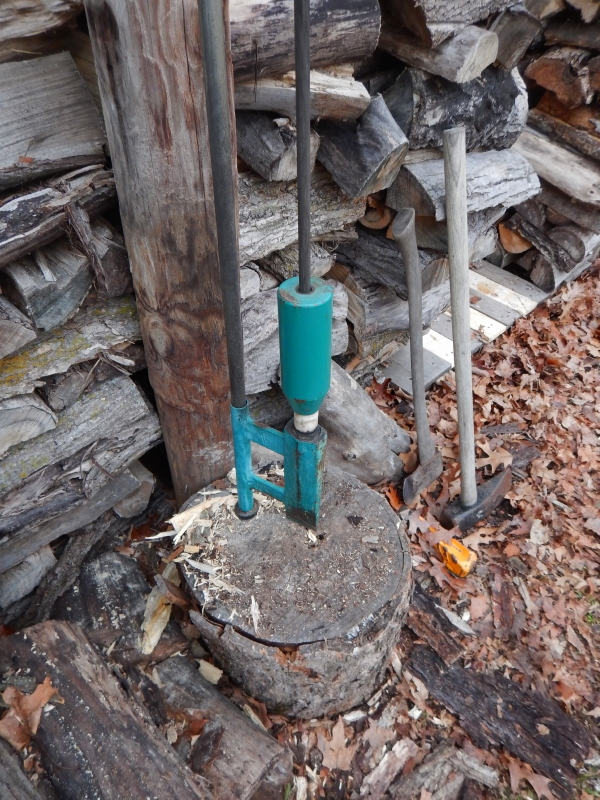 I was working nearby to change out the base of my Smart Splitter® log splitter. 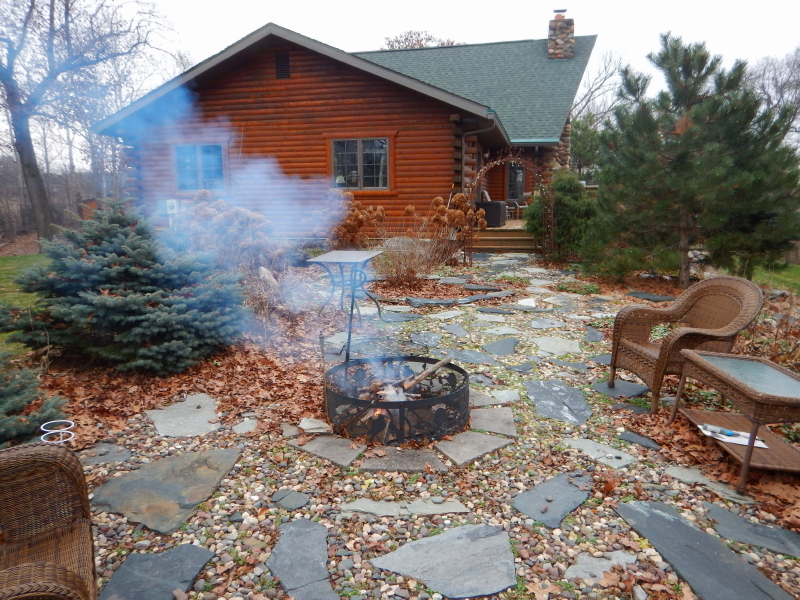 Having a fire nearby provided more than just a place to warm up, it created an ambiance of purpose and energy. I get great pleasure from finally knocking off tasks that have lingered untended for far too long. The base of the splitter was a necessary project because the old one finally started to break up from the pounding that the old decaying wood was taking. In contrast, the task of adding boards to the pallets that form the floor of the wood shed was one of convenience which had been too easily postponed, again and again. First, I needed to dismantle more of the spare pallets I had collected from work, just as I had done to build hay boxes recently. In previous years, the pallets I brought home from work had a full surface of boards, but the supplier figured out they could accomplish the same goal with less lumber. Now they come with half as many boards. 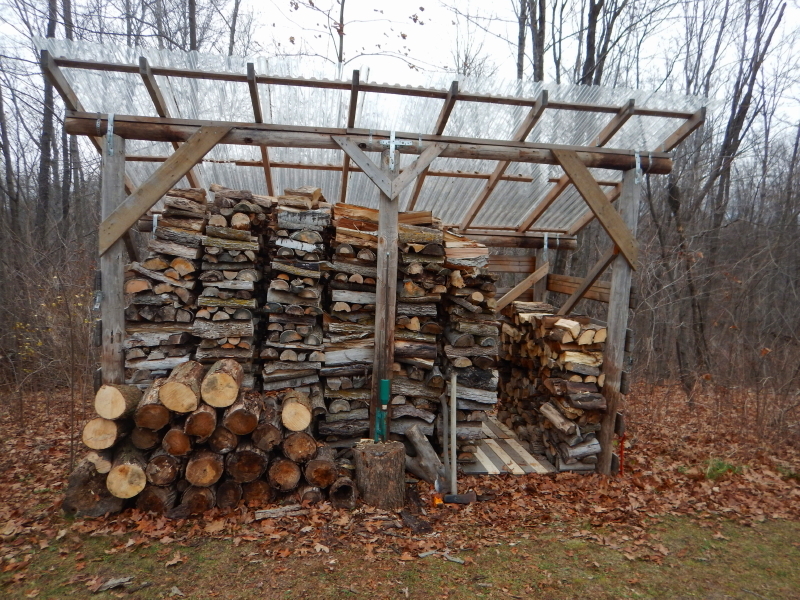 In July when we were stacking hay, I needed to steal some pallets from the wood shed. They were the old ones with a full surface of boards. The next pallets that became available when I was seeking replacements, ended up being the ones with every other board. That became a real ankle twister when I was trying to stack wood. Yesterday, I dismantled new pallets to get boards that I could use to create a complete deck on the ones already in the wood shed. My ankles are saved! Now it’s time to take advantage of the below freezing temperatures and split some logs.